A memorial celebration was held over the weekend as a tribute to Millard Fuller, the millionaire entrepreneur who gave it all away to help establish the Christian house-building charity Habitat for Humanity. Among those who paid tribute to Fuller, who died last month at the age of 74, was former President Jimmy Carter, one of Habitat’s most active high-profile volunteers. 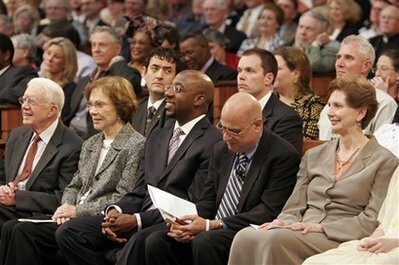 “Our lives were transformed by our relationship with Millard Fuller," Carter said during Saturday’s service at Ebenezer Baptist Church in Atlanta, according to The Associated Press. Beginning in 1976, Fuller forged Habitat for Humanity into a worldwide Christian housing ministry, building 200,000 homes with projects in 100 countries. Fuller spent decades traveling and speaking worldwide, and earned international recognition for his work advocating decent, affordable housing for all.